1. 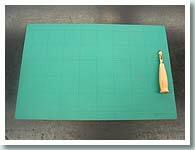 Prepare a handcraft mat or cutting board. 2. Install the blade in the top of the main body. 3. Press the top of screwpunch downward gently. 4. 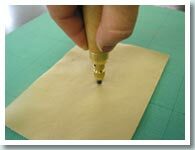 Release pressure when the blade penetrates the material. 5. 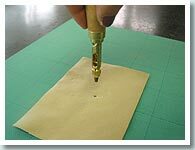 When you have cut the hole, pull the Screwpunch out of the material.. The cut out circle of the material will remain in the blade, but if you continue to cut, the remains will begin coming out from the side of the tool. 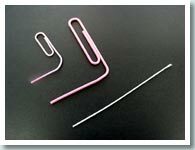 (1) Take some #22 paper covered wire, or a vinyl covered paper clip. 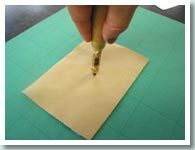 (2) Poke it into the center of the blade. 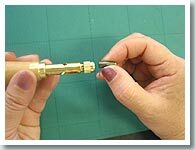 (3) This will push the remaining material out of the side of the tool. 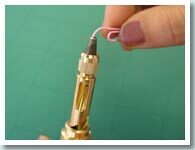 *The Screwpunch is made for making holes, the cut circles can also be used as eyes for human or animals in scrapbooking. *You can now get 5.0mm cut circles using our latest blades. *Note: never use on metals or similar materials since it will cause the damage to the blade.